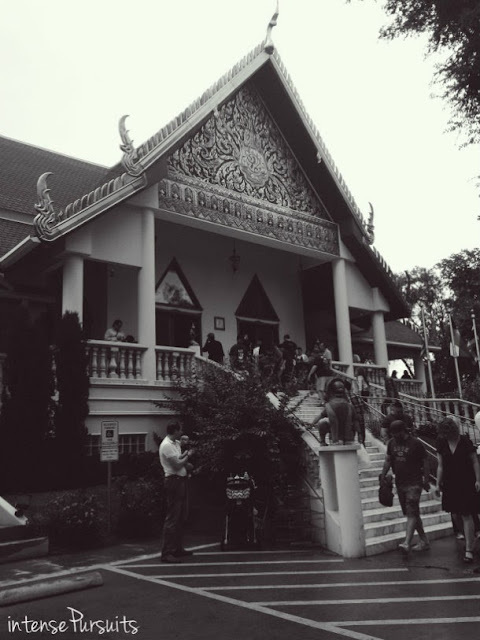 This past weekend held the Thai Food Festival at the Dallas Buddhist Temple. I had long been waiting to visit this temple and couldn't miss this opportunity. As you may have heard about the torrential off season rains claiming Texas, this was also a rainy stormy day. But the rain didn't stop the festival. Asian continent dwellers are well accustomed to rain, so it only heightened their spirits and they continued dancing and keeping the festival going through the rain. But because of the rain we could only do a quick walk through the immense crowd at the festival. There were plenty of booths but most of the food ran out about halfway through it. There was a fighting ring showing martial arts tricks where my husband became glued. There was a cultural show by the koi pond. The temple was holding it's everyday events inside. The monks were walking around minding their own business. Here is a photo tour of what I saw....enjoy!